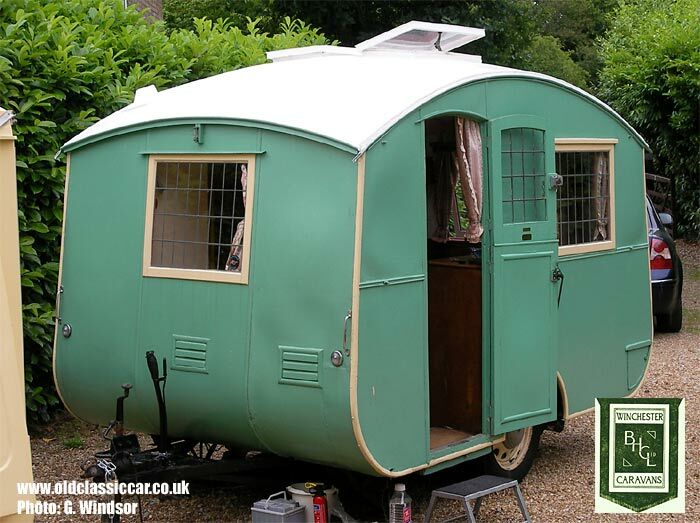 A unique Winchester Imp caravan from 1939, perfect for a pre-war motoring holiday. Homepage. This page: Just the ticket for a pre-war motoring holiday, a two-berth Winchester from 1939. This small 11-foot caravan was made at the works of Mr Bertam Hutchings Caravans Ltd of 124 Stockbridge Road, Winchester, Hampshire in 1939. The only survivor of three Imps ever made, this is an obvious rarity. Winchester van’s were usually a lot bigger before the war and this was a van that was said in the brochure to be made ‘when business was slack’ from the usual larger van production. The 1938 Mk1 van with a different nearside window layout was quickly changed in 1939 to this Mk2 van and was supplied to Mr & Mrs Jack R. Fellows of Cradley Heath, Birmingham on 7th June 1939 for the all in price of £145. (about £7,700 in today’s money). Mr & Mrs Fellows were members of the Winchester Waggoners club and toured Scotland in 1939. 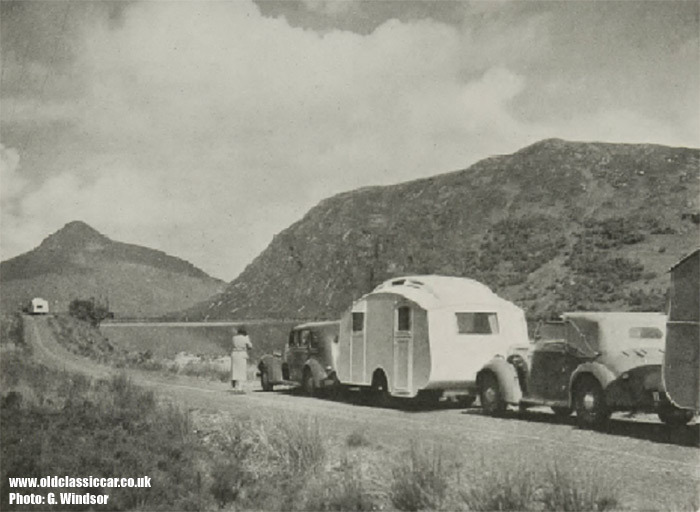 This van can be seen in the accompanying photographs which were used for a number of years by the firm in their brochure and in magazines such as ‘The Caravan’. 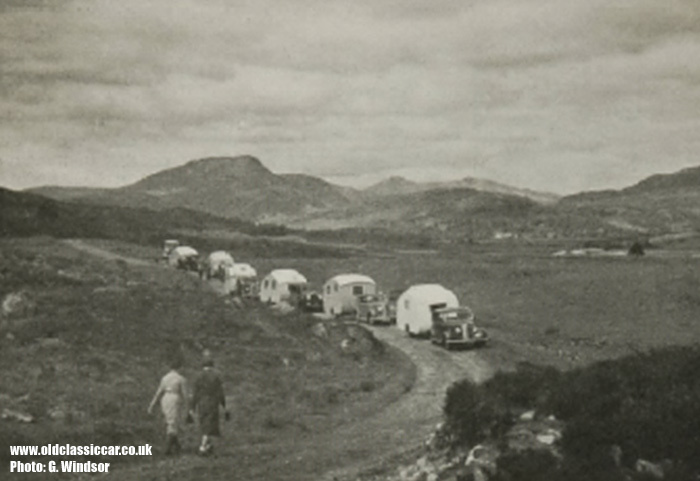 ‘The Caravan’ magazine of August 1939 stated: On his way to Scotland’s Cape Wrath in June, Mr Fellows left Cradley Heath at 6:30am on June the 7th and arrived at Fort William (some 430 miles) at 4pm on June the 8th, having towed through the night, surely a record run! This Van can just been seen in this picture behind the car and van in the centre. The Imp outfit is second in line from the front in the picture above. Jack’s ownership duration isn’t known at present but we do know that the well known caravanner, Harold Catt, owned it before passing onto Alan and Leslie Milbank who took it to the Avoncroft Museum in Worcester on a rally in 1992. In later life it was in the ownership of Miss Jackie Abbitt of Chessington who bought it in 2004 before passing on to us in June 2012. 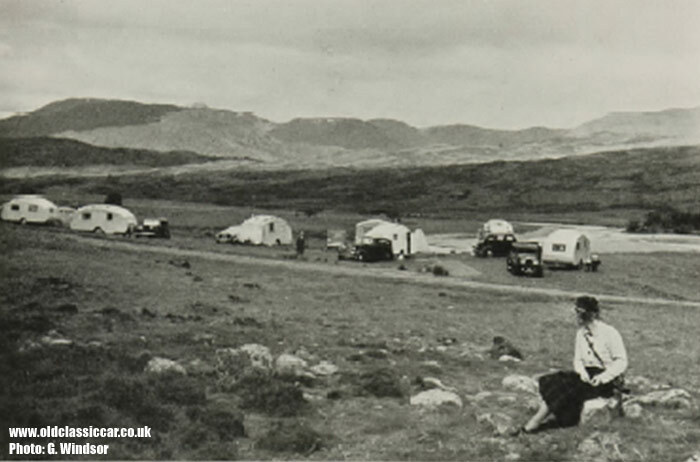 Winchester caravans remained in production until 1959 and were often quoted as ‘The Rolls-Royce of caravans’ and judging by the sheer number of remaining vans we can say they weren’t wrong, the quality certainly helped longevity. The other point about Winchester caravans is the working layout within. Bertram spent month’s away testing vans and designed to make life aboard as ergonomically sound as possible in a given space. The interior is very well thought out, and up to the usual high standards of appointment and interior quality set by Mr Hutchings. Having a built-in toilet compartment and two doors was exceptional in the 1930’s in any van, and to have this in such a small unit was truly innovative. (George's Flickr photo account has a good number of extra photographs showing the interior arrangements: link). We bought this van in June 2012 after hearing about it from a fellow Historic Caravan Club member only 24 miles from our home. Once seen and learning of its provenance we had to have it. The van does need some restoration in parts and this will be done as a ‘rolling restoration’ as time allows. We hope you enjoy looking it over. Thanks for the write-up George, much appreciated. 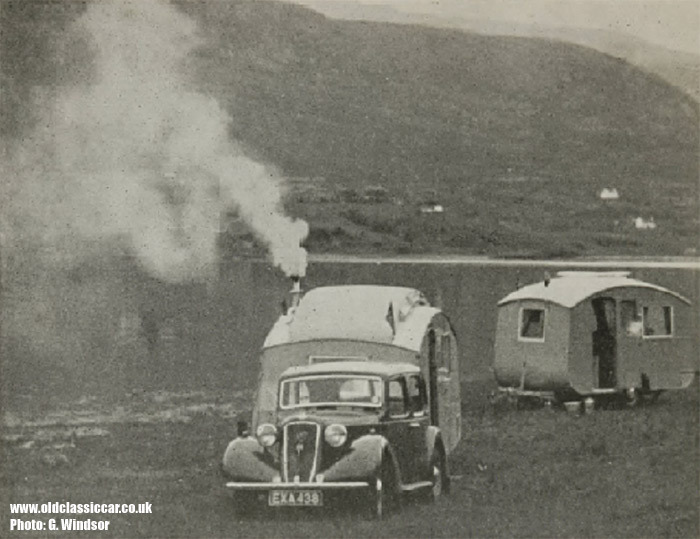 For more articles relating to older caravans, please visit the classic caravans section.